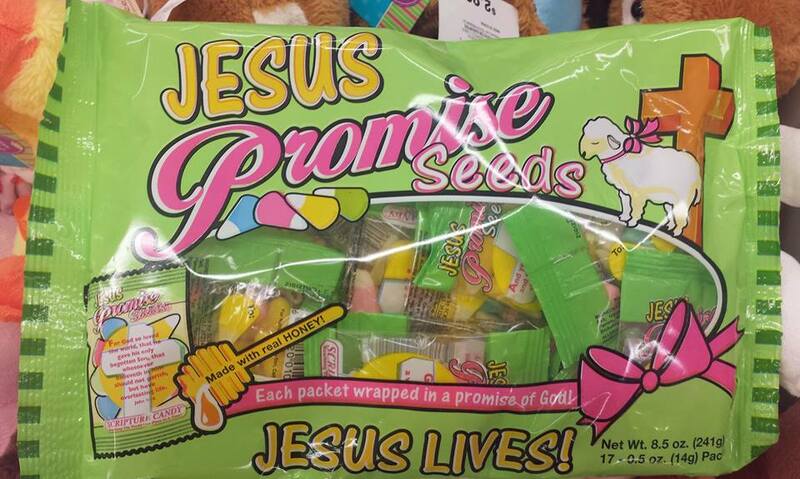 Multi-colored candy corn is now being repackaged for Easter by religious freaks as Jesus Promise Seeds. Sounds yummy and I should know--I tasted a guy named Jesus's seed last night. Fundamentalist Christians want to de-stress cute bunnies and pastel-trimmed baskets and hammer Jesus back into the holidays. Speaking of hammer, why not market them as vinegar-flavored, bloody nails and call them Crucifixion Seeds? This same candy company calls candy corn Harvest Seeds around Hallowe'en because that's the devil's holiday--aka gay Christmas.